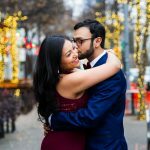 Vanessa & Michael are off to Tulum, Mexico for their destination wedding, but Gia had the pleasure of photographing this gorgeous couple’s engagement session in Austin prior to their departure! First stop was a bar to loosen up and pay homage to a special place. (The “THIS IS IT!” neon sign is so perfect! Oh how I love it!). After a quick outfit change into the sultry burgundy velvet dress and tie-less tailored navy suit, they made their way to a favorite downtown Austin photo spot of ours, Seaholm Power Plant. Holy smokes, these two could be models! 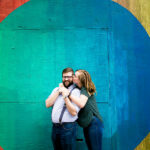 Huge congratulations from us both & I hope you enjoy these urban Austin engagement session photos!